Take part in a unique relay across the township and help us celebrate Canada’s 150th anniversary! 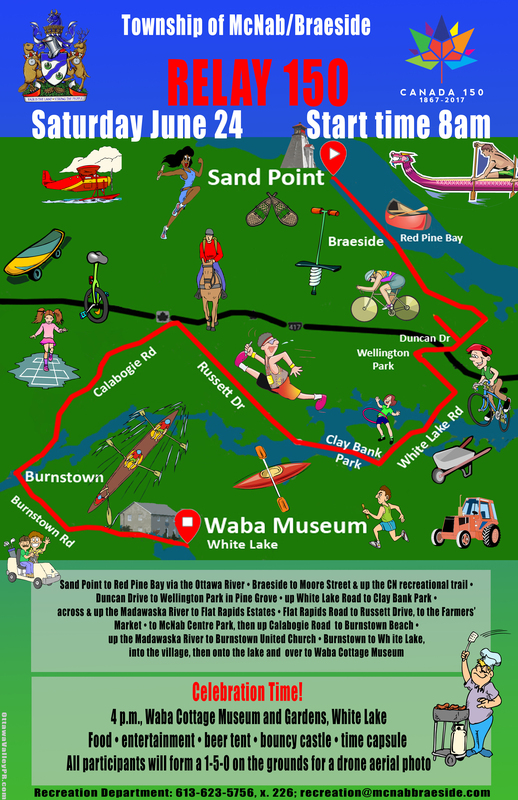 It’s all happening on June 24, starting at the Sand Point wharf at 8 a.m. We’re looking for people of all ages and abilities to participate — and provide a cheering section of course! Participants will carry the baton — carved by Dub Juby, the Valley Carver! — using a mode of transportation of their choosing (skateboard, wheelbarrow, tricycle, bicycle, kayak, canoe, scooter, motorcycle — the sky really is the limit!). We’re looking for as many modes of transportation as possible, for our application to the Guinness Book of Records organization. Finale: Waba Cottage Museum, 5 p.m. — there’ll be entertainment, food, children’s activities, a beer tent and the unveiling of a time capsule. Sign up now and help us Go for the Guinness! More information: Contact Karla Blemkie, Recreation Department: 613-623-5756, x. 226; recreation@mcnabbraeside.com.